Isobel Richardson can cope with most things; her husband's redundancy, a shortage of money, three spirited kids and a demanding old house on the West Wales coast. She sees the loss of Leo's job as a chance for new beginnings and her drive and determination propel the family towards a sparkling new life in Australia. However, Isobel's mother Helen is devastated. Cold and unsupportive, she refuses to join in the family adventure and throws the guilt card firmly down on the table. Isobel is horribly torn between duty and dreams, but Australia's promise of opportunity finally proves irresistible. When the family lands in Oz though, her unbearable guilt at leaving a broken Helen behind is compounded by the pain of missing absent son Ben - and all the while Mother Nature is hatching some plans of her own. Isobel is reduced to a tearful mess pushing Leo away, snapping at the children, overwhelmed, scared and irrational. Worn down and confused, she inches closer and closer to running back to her mother and the life she knew in Wales. Has the great Australian dream really eluded her after all? If you're thinking of emigrating anywhere, you should read this book. I'm a migrant myself, and 20 years after I arrived in Australia from New Zealand, I finally put down roots in the very town that Nene Davies chose for her characters, so I had to read it. By the way, we're no relation - my ancestors left Wales 3 generations ago for NZ. It's a lovely story about hope and taking risks to have a better life but "Distance" also shows the difficulties of leaving behind everything and everyone you love. Most Brits see Australians as a tanned version of themselves but the history and culture is very different and takes some adjusting to, to say nothing of the stinking hot weather up here in the north. I certainly identified with the night sweats and mood swings. I have a sneaking suspicion that the author liberally used her own migrant experience as fodder for her fiction, especially about leaving family behind. So, would-be migrants, read this and think long and hard before taking that huge step. And even if you aren't planning to migrate or already have, it's a good read about a family coping with change through the eyes of the mother. Told in the third person through the eyes of Isobel Richardson, Distance tells the story of a family migrating to Australia from Wales. This is a longed for move, not made easy because of many complications. The time this story spends in Wales is real and atmospheric—the reader gains insight into what it feels like to live there through winter. The author, who clearly has a connection to this wild place, sets scenes with clarity and emotion. When the action moves to Queensland, Australia, the mood shifts slightly. This is a different country with an atmosphere all its own. The author manages to convey this through action and dialogue. Throughout the story, the emotions and actions of the characters in their given situations seem valid. Isobel is a person who feels emotions intensely and this causes her problems. The reader lives through these difficult times with the character. Distance is a fine piece of storytelling. Recommended. Ever had a dream to move to a tropical paradise on the other side of the world? For Isobel Richardson, self-confessed Aussiephile, that dream becomes reality when a sudden change of circumstances opens a window of opportunity. Her husband is keen, the kids are set. The bleakness of a Welsh winter spurs them on. What could possibly go wrong? 'Distance' is an easy-to-read novel about families and change. Of particular interest is the unravelling relationship between daughter and mother, characterised by emotional blackmail and punitive silence. As the first novel of a trilogy, the ending is rather abrupt but the author sets up some compelling questions, which I'm guessing she'll explore in the next book. Can't wait to read 'Further'. This story takes us into the heart of a family. Dialogue and interactions feel absolutely authentic - between parents, between parents and children and between siblings. When redundancy visits the Richardsons, all aspects of their secure lives in the Welsh coastal village are tested. Parental closeness is stretched thin enough to worry the children when solutions are elusive. Readers are taken on an emotional journey until Leo and Isobel's innate resilience comes to the rescue and family balance is restored. But the pattern has been broken and a long held dream of living in Australia beckons. Suddenly migration becomes possible and a new clutch of issues emerges; practical issues, complicated decisions, assumptions that don't hold up, searing guilt and sorrow when Grandmother Helen refuses to go with them, leaving life-long friends. Although the family throw themselves into living the dream, not everything is rosy in the land Down-Under and relationships and understandings are challenged again. "A biting wind cut straight through Isobel's blue fleece, as she tramped along the beach with a beanie-topped and buffeted Leo at her elbow.
. . . . . the seemingly ownerless dogs hurtled along the edge of the seething water in a pack, tails tucked and haunches bunched as they tore after flying splats of dirty white beach foam." "A tiny Willie Wagtail was shimmying on a rough patch of vegetation at her side. The bird caught her attention with its joyful dance and as she watched it, her senses melted, her jaw relaxed and for the first time in a long while, she started to feel in control. Cautiously, she took Helen's words and spread them out in front of her mind's eye." This is a novel for anyone with an interest in family relationships, and particularly the stresses and strains of migration. If you've been there and survived, it will resonate. If you're thinking of it there are insights galore. Although the story ends with a satisfying sense of rightness and completion so far, readers are left with a sense that the family will have more adventures to relate. Looking forward to the sequel. Davies, Nene (2013-06-13). Distance (Kindle Locations 3919-3920). Really Blue Books. Kindle Edition. Many people talk of a new life abroad but few take those big steps to a new country. With a narrative no-doubt somewhat based on true experiences this book provides a two-dimensional insight to emigrating. Notably unexpected variables present significant challenges, yet through perseverance the dream is eventually fully realised physically and emotionally. It is a well-written story with an impressive surprise to end with. Hard to write a review with tears still in my eyes! What a great book. It conjures up feelings I think most of us have at one point or another about taking risks and moving on for another life in a different place. A beautifully written novel, atmospheric and breathtaking descriptions of people and place. At times I wondered what the mother was thinking with her attitude to certain events, but if I'm honest I can see myself reacting the same way. Sometimes love hurts, and she had so many things pulling at her. The beginning tied in beautifully with the ending. I'm looking forward to the next book by this author. 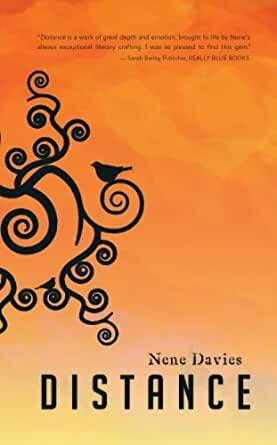 5.0 out of 5 stars"Distance" by new author Nene Davies, is a delight. "Distance" is a wonderfully warm, family story, full of wit, great dialogue and events people can relate to. It opens in Wales, during a cold wet winter, when Isobel Richardson is dreaming of migrating with her family to sunny Australia. Then Leo, her husband, loses his job and decides to go back to university and study for a new career. Arrangements to migrate take a long time, but eventually Leo is granted a place at the Central Queensland University the they travel to "Oz", finally settling at Yeppoon. It hasn't been easy of course. The oldest son, Ben, has to stay behind to finish his schooling and Isobel has to find work to help support the family while Leo studies. To add to the difficulties Helen, Isobel's ageing mother is devastated and angry that the family have left and she makes life difficult for Isobel, who isn't coping well. Nene writes some sad, some funny, but very real family situations. The writing is good, very readable and the reader is carried along with this loveable family to a satisfying ending. 5.0 out of 5 starsDistance tells of a family's journey when they decide, for better or worse, to relocate to the far side of the world. Nene Davies uses the experience of her own family's relocation from Wales to sunny Queensland, Australia, to craft a totally absorbing story of loss, doubt, hope, guilt, confusion and determination. The protagonist, Isobel, as well as having to cope with her husband's reaction to an unexpected redundancy, finds herself slowly and inexplicably sinking under the weight of decisions that should be making her the happiest person on earth. Although this is not her own family's story, it reads as a really true to life account, with exquisite descriptive detail of emotional highs and lows, that has you grasping for the tissue box, and keeps you reading on...and on, till the story concludes. But does it?